The basic premise when building new estates for the fledgling industrial town of Emmen was to create an 'open, green city' combining the advantages of living in the landscape with multifarious urban facilities and a compact town centre. 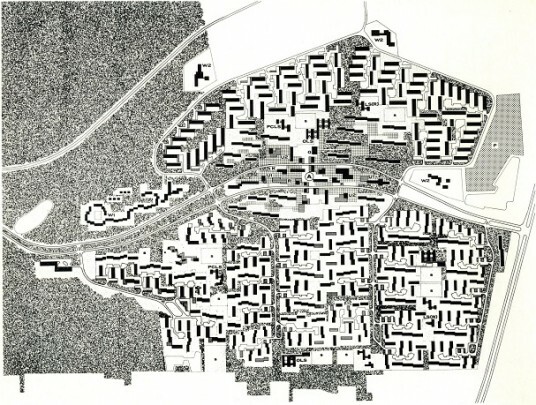 In Angelslo (begun 1960) and Emmerhout (1966-1975), numerous urban design elements were developed that would reappear during the 1970s in many low-rise districts across the Netherlands. The residential areas embroider on urban and architectural themes of the Modern Movement. Their architecture is sober, methodical and functional, except for the -now demolished- 'structuralist' primary schools built there in timber frame construction by Forum magazine editor G. Boon. Both estates are reached from a central highway criss-crossed by neighbourhood streets, many with dead-ends. Off these are cul-de-sacs accessing the clusters of dwellings. Green zones between the neighbourhoods contain schools and playing fields. Here motorized traffic takes second place to cyclists and pedestrians. In Emmerhout this access system has produced interlinked, slightly sunken parking places and half-paved, half-planted public areas between dwellings. The street has resolutely made way for the 'woonerf' or pedestrian priority area. A stepped arrangement of plots prescribed by the urban designer De Jong emphasizes the individuality of each house. This sturdy urban structure can easily prevent any potential tendency towards chaos. Subsequent applications of this system have invariably resulted in too many access types and too much variety in general, but worst of all in housing estates completely devoid of any kind of coherence. Like other post-war estates the ones in Emmen are having their housing and living environment revivified, an operation that includes demolishing small dwellings and increasing the residential density.